“Our annual Tri-Cities conference creates unity by providing accessibility, compassion, collaboration, education, and support to those living, working, and supporting the journey known as autism,” said Kandis Burney, Executive Director for Autism Society of East Tennessee. families are affected by autism. Based in Knoxville, the Autism Society of East Tennessee provides services to 36 counties in East Tennessee, including Johnson County and it is part of the larger nationwide organization of The Autism Society, which provides information regarding treatment, education, research, and advocacy for autistics and their families. The Autism Society of East Tennessee is dedicated to connecting individuals, families, service providers, and educators in the Tri-Cities with programs, services, and resources based on their needs. Johnson County Schools Supervisor of Special Education Paula Norton is in charge of the various special education needs of students in local schools. This year’s conference scheduled for Saturday, April 27 includes a new location and new format at the Northeast State Community College in Blountville. Professionals, experts, and specialists from Laurel Heights Hospital and other local providers will host sessions covering a range of topics including Understanding Psychiatric Crisis for Children with Autism, Applied Behavior Analysis 101, Maximizing Your Child’s Treatment, and Conservatorships. Attendees will also have the opportunity to meet and greet with local exhibitors providing services within the East TN area. “We are thrilled to be partnering with experts across the state from organizations like ARC of TN, STEP, Special Needs Law Center, Tennessee Respite, and others to bring you the most current and helpful information about autism,” a statement emphasized on the event’s website. The Johnson County JAM Program annual JAMboree held on Tuesday, April 9, drew a large crowd while it has once again managed to showcase all that the JAM kids have been working on over the past several months in their JAM classes. According to event organizers JAM (Junior Appalachian Musicians) meet on Tuesday evenings at the First United Methodist Church, during which time, JAM students are taught guitar, mandolin, banjo, and fiddle by talented local musicians. The students receive not only instruction in traditional Appalachian music, but they also have an enrichment time every Tuesday evening to learn more about our Appalachian culture and heritage. The annual JAMboree is the biggest fundraiser of the year for the program, which is said to finish up the year with 60 talented student-musicians. The Silent Auction, which supports the program, has reportedly raised $1700 this year. It is estimated that the JAMboree and Silent Auction combined has made more than $5,000 so far this year. Johnson County JAM program officially began in September 2016 and is an affiliate of the Junior Appalachian Musicians, which has more than 40 affiliate programs in North Carolina, South Carolina, Virginia, and Tennessee. The Johnson County JAM program is one of the largest in the region, boasting of six instructors including Mike Taylor, Marty Pennington, Sarah Ransom, Mary Rachel Nalley, Kody Norris, and Shannon Courtner. “We have an amazing team of volunteers,” said Tia Thomas. “Volunteers include Tim and Miranda Horne, Leah Ransom, Naomi Hammons, Taffy Dugger, and Jim and Michele Crowder. The JAM advisory board includes Taylor, Horne as well as Celia Pennington, Christi Gentry, Russell Love, Cristy Dunn, and Evelyn Cook. The board now plans to offer a JAM camp this summer. While details are still being worked out, the camp is scheduled to be held the last Thursday and Friday, July 25 and 26, 2019. For more information on upcoming events or student application, please visit the Johnson County JAM Facebook page. To request an online application, please email jocojam@hotmail.com. Applications will become available at the Art Center and the Community Center for the 2019-2020, program year. The JAM program relies heavily on individual donations and grants to help supplement the low tuition cost of $5 per week per student. Donations can be mailed to Johnson County JAM PO Box 272 Mountain City, TN 37683. Rep. Hill’s legislation on Healthcare passes House greeted with mixed reaction. House Bill 1280 calls on the Governor, acting through the Commissioner of Finance & Administration to submit a waiver to the federal Centers for Medicare and Medicaid Services to immediately provide assistance to the state’s TennCare population through the implementation of block grants. Many, including Executive Director of the Tennessee Justice Center, Michele Johnson, who feels the House passed a bill to turn Medicaid into a block grant are convinced that House Bill 1280 will actually do more harm than its intended improvements. Anna Walton, Health Policy Associate with the Tennessee Justice Center, (TJC) noted the seeming confusion about what a block grant would do, including within the legislature, and that the main arguments she has heard have to do with state flexibility. House Bill 1280 now awaits action from the Senate, and its future effects for Tennessee’s most vulnerable remains to be seen. Representative Timothy Hill is Chairman of the House Commerce Committee. Hill can be reached by email at Rep.Timothy.Hill@capitol.tn.gov or by calling (615) 741-2050. Tennessee Governor Bill Lee announced $14.8 million in broadband accessibility grants that will expand broadband service to more than 8,300 households and businesses in 17 counties across Tennessee. The U.S. Federal Communications Commission (FCC) defines broadband as data transmission technologies that are always on and capable of simultaneously transporting multiple signals and traffic types between the Internet and end users. In January 2015, the FCC upgraded the definition of broadband speeds for downloading content from 4 Mbps (Megabytes per second) to 25 Mbps and for uploading content from the previous rate of 1 Mbps to a new standard of 3 Mbps. The FCC notes that with the revised standard, 13.1 percent of American households do not have access to broadband. percent, or one in four rural Tennesseans lack access to broadband. In addition to the $20 million included in Gov. Lee’s recommended budget for the fiscal year 2020, these grants will continue to close the access gap ensuring rural Tennesseans have the tools needed for growth and prosperity. The Tennessee Department of Economic and Community Development (TNECD) is working with the 13 grantees who demonstrated a high need for grant funding. Recipients also demonstrated the ability to implement and sustain the project long-term with strong community support. and access to all Tennesseans, funds are generally targeted to areas that are unlikely to receive broadband service without grant funding. 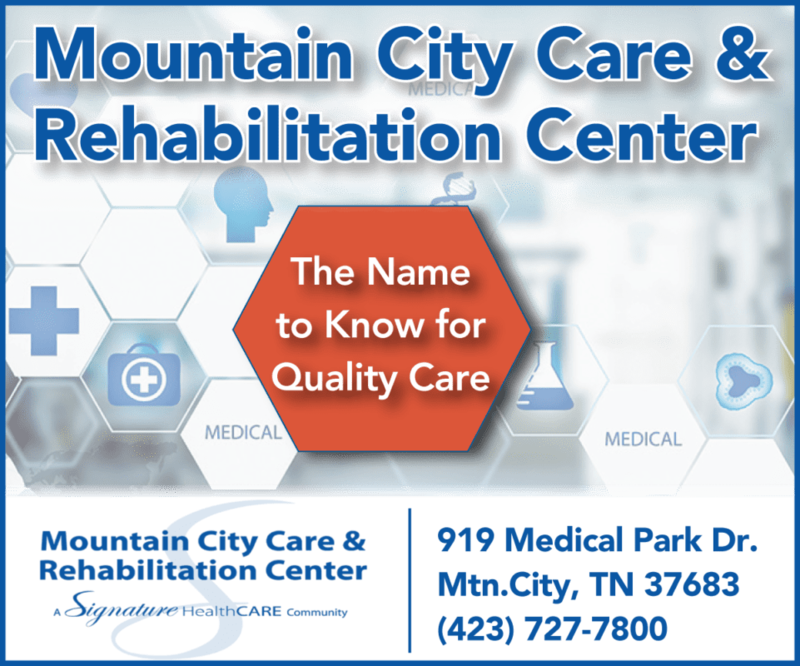 The average download speed in Mountain City is 55.76 Mbps, which is 32 percent faster than the average in Tennessee and 23 percent faster than the national average. While there are eight internet providers in Mountain City, only five of those offer residential service. According to the FFC, Tennessee is the 25th most connected state in the U.S.
Johnson County Sheriff’s Office responded to a late night shooting incident on Wednesday, April 17, 2019 on Pine Mountain Road, in Johnson County, TN. According to the Johnson County Sheriff’s Office, during the course of the overnight investigation facts were developed to lead to the arrest of Alfred William Pauley, 48. Pauley was charged with Attempted Second Degree Murder. The victim was listed in Critical Condition at an area hospital at the time of this press release. The Tennessee Bureau of Investigation and the Ashe County North Carolina Sheriff’s Office assisted in the investigation. Pauley is currently being held in the Johnson County Jail with a $50,000.00 dollar bond. That Mountain View Nursery and Landscaping, LLC has successfully served the outdoor living needs of its costumers for decades and that it is no stranger to many in Johnson County, is nothing new. What is new, however, is that the long-enduring business owned and operated by Harvey Burniston Jr., now welcomes its customers at a brand new second location right in the heart of Mountain City, offering services and products in landscaping, hardscaping, and outdoor living, while boasting of being one of the largest and most diverse container nursery in Johnson County. Under an extended title of Mountain View Nursery and Landscaping Home and Garden Center, located on U.S. Route 421, next to the Garden Barn, Burniston has managed to bring his passion for outdoor living as well as offer his skills, expertise, products and ideas right to the doorstep of local residents. With a master’s degree in agriculture education along with more than 30 years experience designing and creating beautiful landscapes under his belt, Burniston has every reason to be confident of his business’ future success. Over the years, Mountain View Nursery’s reputation has spread mainly by word of mouth advertising, while Burniston has earned a reputation of being honest, hardworking, and fair in his teaching profession as well as his landscaping business. Of course, the business’ success has a lot to do with the talented crew that Burniston has managed to recruit including Nursery Manager, Holly Rominger, who will now oversee the daily operations of the new Mountain City retail location. Rominger has plenty of skilled hands on deck to assist her, like Hardscape Manager, Ricky Hansen, a graduate of Tennessee Technological University with a BS Degree in Agriculture Engineering and Education. Hansen specializes in the hardscaping and irrigation portion of the business. With many more talented employees assisting costumers, there is little doubt about Mountain View Nursery and Landscaping Home and Garden Center’s impact on the community. services while offering competitive prices without the need to drive far to get good service is a win-win for everyone. Mountain View Nursery and Landscaping Home and Garden Center are now open Monday through Friday from 8-5 p.m. and Saturday from 8-2 p.m.
For more information, please visit www.mtnviewnursery.com. “If the world is going to be saved, it’s going to be by the arts,” Evelyn Cook told the Johnson County Center for the Arts crowd as she introduced a special guest. Mountain City welcomed International Storytelling Center Director Kiran Singh Sirah on Thursday, April 4. Sirah maintains that art connects everyone and that everyone carries art within them. He overcame adversity and has spent his life helping others connect through the arts. “The arts are expressive forms in which we share our stories with the world,” said Sirah. Storytelling enamored Sirah from the beginning. The education system in the form of teacher Len George finished the job. Mr. George’s stories inspired hope in Sirah, which he now emulates everywhere he goes. That hope continues to spread. Events such as Sirah’s Side by Side festival celebrating faith brings people together from different backgrounds, religions, and races to connect on a human level. Religious groups stand together and share their stories and cultures. Side by Side is now an annual event. Sirah spearheaded the Bigger Busters program in Glasgow. This program set out to conquer the hate and fear between Catholics and Protestants. Children from both religions participated in activities together. Mothers bonded over loss. This shows that bonds are stronger than labels. Sirah says that the world is full of storytellers sharing their tales. These combined stories make up this nation and are the shortest distance between people. He traveled to homeless shelters to hear the occupants’ stories and understand their concept of home. One occupant summed it up nicely. Home is a place in your memory where you are happy. Programs such as Side by Side and Bigger Busters show that labels only have the power society gives them. Bigger Busters has had over 100 thousand participants so far. Kiran Singh Sirah is a social justice warrior that uses storytelling to fight for equality. He was honored with an international Champion of the Peace award for his work using storytelling as a peacemaking tool and previously worked in conjunction with the Pentagon and US State Department to develop story-based methods for conflict resolution and PTSD. The U.S. Census Bureau is recruiting thousands of workers for temporary jobs available nationwide in advance of the 2020 Census. By visiting 2020census.gov/jobs applicants have the opportunity to apply for a range of positions, including recruiting assistants, office operations supervisors, clerks, census field supervisors and census takers. The positions will be located across 248 Area Census Offices nationwide and offer flexible work hours, including daytime, evenings and weekends. • Recruiting assistants travel throughout geographic areas to visit with community-based organizations, attend promotional events and conduct other recruiting activities. • Office operations supervisors assist in the management of office functions and day-to-day activities in one or more functional areas, including payroll, personnel, recruiting, field operations and support. • Clerks perform various administrative and clerical tasks to support various functional areas, including payroll, personnel, recruiting, field operations and support. • Census field supervisors conduct fieldwork to support and conduct on-the-job training for census takers and/or to follow-up in situations where census takers have confronted issues, such as not gaining entry to restricted areas. • Census takers work in the field. Some field positions require employees to work during the day to see addresses on buildings. Other field positions require interviewing the public, so employees must be available to work when people are usually at home, such as in the evening and on weekends. For more information, please visit 2020census.gov/jobs or the Census Bureau’s Facebook, Twitter and LinkedIn pages. Carter County Planning Commission chairman, Chris Schuettler, right, talks about the new 130-acre Watauga Lake Resort project in Carter County in the Butler Johnson County TN area. The project is promising a sizable economic impact for all surrounding counties, including Johnson County. The revealing of a 130-plus-acre resort in Carter County boarding the Johnson County line in the Butler area made headlines last week as well as prompting local officials to weigh in on the new facility’s local impact. Following a lengthy discussion, the Carter County Planning Commission unanimously voted to approve the conceptual designs for the three-phase $30 to 45 million resort project that will feature a 22-room inn, restaurant, a community village, including cottages, condos, and vacation rentals as well as an ice skating rink. The project located off Highway 67 near Butler is developed by California native and Carter County resident Daniel Goodhall. For starters, the new resort is located close enough for jobs,” Taylor said commenting on the 500-plus jobs that the new resort is promising to bring to the region. Taylor emphasized the benefits including enhancement of local tourism for the Doe Mountain region as well as restaurants. Regionally, it will be beneficial for all of us,” Taylor said. Of course, as it is the case with all such projects, the new resort is not immune to concerns including those pointed out by residents from both counties. One concern pointed to the resort affecting the natural landscape of the Watauga Lake shoreline and mountains. Carter County Planning Commission chairman, Chris Schuettler, said that the resort would have a rustic look that will blend into its surroundings while not blocking views of the sunset off Watauga Lake. One of the other concerns was the resort’s effect on traffic on Highway 321, which connects with Highway 67. Schuettler ensured that the impacts on traffic would be minimal on both Highway 67 and 321 but suggested that if the resident wanted a traffic-impact study to be done on the project that they would need to address the Carter County Highway Committee which can petition TDOT to do a study. Commenting on the potential traffic issues, Taylor said he hopes that Carter County officials look at the road issues and that a traffic study will be done to address the issue. “Over all and regionally this will be a benefit for all of us,” Taylor said. Acknowledging that the project will “bring people right to our front door” Taylor emphasized that the project is an opportunity for Johnson County. spring and early summer of 2020. While Johnson County voters made their voices heard in November, voting “yes” to on-premise consumption and package stores, the process of passing an ordinance establishing requirements and regulations has been complicated and time-consuming. Per George T. Wright, City Attorney, the second and final reading on both beer and liquor ordinances is set for the May 7 meeting of the Mountain City Mayor and Board of Aldermen meeting. Prospective retail package store retailers would have to apply after the Town of Mountain City approves specific regulations regarding the retail sale of liquor, and if those are specifications are met, an Order of Compliance would be subsequently issued. At that point, an application can be made at the state level. After a completed application for a retail store is received, the application must be placed on the agenda and approved by the TABC commission at a regular monthly commission meeting. Adherence to specific regulations is also required. For example, a retail store must be located on the ground floor with one main entrance opening on a public street with no other door or entrance for use by the public unless the store is located on the corner of two public streets. Under those circumstances, a retail store could have a door opening on each of the public streets. Along with the repeal of Prohibition, the 21st Amendment of the United States Constitution gave individual states the right to control what parties can sell alcohol within the state, how the distribution of alcohol in the state would take place, and who would be able to possess alcohol within the state legally. States and even local jurisdictions have significant differences in who can legally sell, buy, and possess alcoholic beverages. State law generally gives cities the authority to license and regulate the retail sale of intoxicating liquor once local option election results approve it. State statute regulates many aspects of local liquor licensing, though a local authority may, in some instances, supplement state statute with stricter standards via a local ordinance. Additionally, retail stores are required to close on Christmas, Thanksgiving Day, and Easter. Hours of operation for retail package stores are also set. Retail package store managers must hold a manager’s permit and employees of a retail store must be at least eighteen years old and must be certified clerks. In addition to employee requirements, there are laws regarding ownership of retail package stores. For instance, an owner cannot hold any type of public office, or have any interest, either direct or indirect, in any other retail liquor store, wholesale license, or liquor by the drink license. There are stipulations for prospective retail package store owner with felonies. Under current legal scrutiny, is Tennessee’s residency requirement, which says one must reside in the state for a minimum of two years to obtain a retail liquor license and for at least ten years to get a license renewed. An important topic of discussion at the recent meeting of the Board of Alderman was the many improvements and updates needed around town with several projects mentioned. Mayor Kevin Parsons mentioned that he would like the signage at the city limits to be updated to include recognition for local civic organizations such as the Kiwanis Club. Public Works Director Gary Phillips stated that moving the existing Kiwanis Club signage closer to the city limit signage could be made quickly. Phillips made plans for his crews to do so and it has since been taken care of. Chief of Police Denver Church requested a signage update for crosswalks around town, which included 12 signs at an estimated cost of $100 per sign. Alderman Bob Morrison made a motion for a budget amendment of $1,500 for the necessary signage. The discussion on improvements continued in connection with the crosswalk light at Highway 421, and Highway 67, which according to officials is in much need of repairs. The estimated is $5,485.50 with $2,200 already paid for previous work and troubleshooting the issues. Alderman Lawrence Keeble made a motion to move forward with this project, citing safety concerns for the town. Addressing a much talked about blight in town, Mayor Kevin Parsons made mention of a downtown building in disrepair. take possession of the building. That the meeting was improvement oriented there was little doubt. Thanks to the recent momentum of growth in town and the county, the effort is welcomed by the community. while the roadway was cleared from debris. Johnson County Schools’ Transportation Supervisor, Barry Bishop, 57, was back in court Friday, March 29 for his ongoing criminal case regarding the allegations brought forward after a joint investigation by the Tennessee Bureau of Investigation and the Tennessee Comptroller of the Treasury. The investigation led to his indictment of one count of theft over $10,000, followed by Bishop’s arrest on January 3, and arraignment on February 8. During the investigation, TBI agents developed information that between January 2015 and May 2017, Bishop used his position as the transportation supervisor for the school system to perform skills testing for commercial driver’s license applicants. According to the comptroller—based on interviews—employees performed maintenance on their vehicles after normal working hours with parts and supplies purportedly purchased with their personal funds. Bishop is currently out of jail on a $15,000 bond, while Case 2019CR1 has become an ongoing case with the Johnson County Criminal Court system, spanning several months so far. The Johnson County School system remains compliant with all state recommendations and is maintaining a “business as usual” approach. All of Bishop’s duties, caring for the “day-to-day” of busses including supervising bus employees are currently covered by Dr. Stephen Long, while Dr. Herbie Adams is covering Maintenance and Career Technical duties. There was then mention that a motion for discovery had already been filled and carried out. Dates were set for the pretrial and the trial. The pretrial motion date is currently set for June 3, and the trial itself is currently scheduled to last for two days on June 25 and 26, 2019. Judge Rice warned both parties that all pretrial motions must be filed no later than May 30 in preparation for trial. Bishop and his attorney agreed as well as the prosecutor. All involved will no doubt be making their filings and preparing for the upcoming late June trial. Johnson County Sheriff’s Office and the Tennessee Bureau of Investigation (TBI) concluded its investigation of the recent shooting incident in Johnson County, Tennessee involving 2-year-old Ariel Salaices, of Laurel Bloomery. In a press release on Monday morning, Johnson County Sheriff, Eddie Tester stated, that as a result of an investigation into a shooting incident in Johnson County Tennessee on March 15, 2019, investigators have resolved the case. Tester emphasized that the incident was investigated by the Johnson County Sheriff’s Office and assisted by the Tennessee Bureau of Investigation. As it was reported last month, the bullet that hit the back of Ariel’s head ricocheted off of a metal post on the swing and slide set located in her back yard. Ariel was first flown to the Johnson City Medical Center for treatment before transported to Knoxville. The incident is by no means unprecedented. Organizations such as awareness group, Bullet Free Sky has been advocating against celebratory gunfire and unlawful discharge of a firearm for years. well and progressing. Keep praying! To reach the Johnson County Sheriff’s Department, please call 423-727-7761. Anyone who would like to donate to help with the Salaices’ expenses can do so on Ariel’s GoFundMe page https://www.gofundme.com/ariel-salaices. in July at Miss America’s Outstanding Teen competition in Orlando. The competition featured 24 candidates from around the state of Tennessee before Parsons was crowned enjoying the spotlight and receiving a well-deserved title. According to competition officials, as Miss Tennessee’s Outstanding Teen, Parsons received a $3,000 College Scholarship and the opportunity to compete for the Miss America’s Outstanding Teen title in Orlando, Florida on July 23-27. Currently a student at Johnson County High School, Parsons hopes to use her scholarship winnings through the Miss America’s Outstanding Teen Program pursue a career as a Pediatrician. Moments after being selected, Parsons reportedly shared her excitement about winning the title. “I am already looking forward to my duties this year – traveling, meeting new people and getting the word out about my platform, “The Color Red,” said Parsons. During her year as Miss Tennessee’s Outstanding Teen, Parsons will travel throughout the state of Tennessee advocating her platform issue. Parsons wants to be a Pediatrician, so the process of Blood donation is close to her heart. Parsons hopes to talk to various government representatives, business leaders, community groups and citizens-at-large, urging them to get involved in the fight for Project Red. Hollie Alexander and Elisabeth Reef, Co-Executive Directors of the Miss Tennessee’s Outstanding Teen, commented on the new Miss Tennessee’s Outstanding Teen. Parsons did not shy away from expressing her feelings about having the opportunity to represent her state. MAO Teen Competition has made available more than $9,400 in scholarships and cash awards for 2019 for the 24 young women throughout the State of Tennessee. Taylor Parsons will represent Tennessee July 23-27 at Miss America’s Outstanding Teen in Orlando. 1st Runner Up Chloe Warren, Miss Sumner County’s Outstanding Teen winner of a $2,000 College Scholarship. Teen Competition has made available more than $9,400 in scholarships and cash awards for 2019 for the 24 young women throughout the State of Tennessee. Taylor Parsons will represent Tennessee July 23-27 at Miss America’s Outstanding Teen in Orlando. The Tennessee Department of Economic and Community Development (TNECD) announced last week the five counties chosen to participate in the latest round of the Select Tennessee Property Evaluation Program (PEP), which originates from the department’s Select Tennessee Certified Site Program. Each round of PEP selection is based on the demonstrated local need for industrial properties and the county’s ability to assemble viable properties with market potential. The timing of the news could not have been any better for the region, as the momentum in Johnson County and Mountain City is about as noticeable and welcomed as it can get. Taylor confirmed that he had submitted four pieces of properties (two on Highway 91, North and two on U.S. Route 421 South) that may potentially be suitable for evaluation. Started in 2015, PEP is designed to improve the inventory of industrial sites and buildings in Tennessee. According to officials, the program evaluates potential properties, advising counties on where investment may be most beneficial and how sites can be improved to attract prospective companies. Before this round, 47 counties have participated in PEP. PEP originates from the department’s Select Tennessee Certified Site Program. With the assistance of site selection firm Austin Consulting, PEP benefits participating counties by providing guidance on site planning for future industrial development projects. For counties selected to participate, PEP includes an on-site visit by Austin Consulting and TNECD, an educational webinar on the site selection process and a comprehensive assessment addressing the strengths and needs of a community’s inventory of industrial sites. This assessment also offers recommendations for communities to improve marketability. The application process typically begins with the submission of a letter of intent, which is accepted at any time. Upon receipt of the letter, interested communities will be provided with the PEP application. A new round of communities will be accepted into the program in the fall of 2019. For more information, please visit, www.tnecd.com. Follow on Twitter and Instagram: @tnecd, facebook.com/tnecd. Johnson County, investigators, the JC Sheriff’s Office and the Tennessee Bureau of Investigation concluded its investigation of the recent shooting incident in Johnson County, Tennessee involving 2-year-old Ariel Salaices, of Laurel Bloomery. In a press release this morning, Johnson County Sheriff, Eddie Tester stated, “As a result of an investigation into a shooting incident in Johnson County Tennessee on March 15, 2019, investigators have resolved the case. During the course of the investigation, investigators determined that 2 year old Ariel Salaices was shot by another child who was playing with a pellet rifle. At the recommendation of the District Attorney General and due to the fact that the incident occurred as a result of a tragic accident, no charges will be placed. According to a Facebook post this morning, “Ariel is STILL breathing on her own!! She had a restless night, but she is doing better with the adjustments they made for her breathing . She is resting but still very agitated. Going to replace her feeding tube today. Ariel is doing well and progressing. Keep praying! equipment. It would be stationed at Pioneer Landing Marina on Watauga Lake. Submitted photo. The Elk Mills Poga Volunteer Fire Department would like to add another layer of protection to their fire department in the form of a fireboat. The boat would be a part of the Johnson County Fire Department equipment but would be stationed at Pioneer Landing Marina with nearby Lakeshore Marina having already agreed to do any needed services for the boat. Benefits to our area would be many. The proposed boat would be equipped with a mounted pump, “deck gun,” as well as a portable floating pump. The boat will also have a first responder medical bag and AED. With the additional benefit of the fireboat also being able to fill tanker trucks closer to fires that are not on the lake. A 27-foot Maycraft boat that fits all of their needs has been located for sale at a reasonable price, and they are currently in agreement with the boat’s owner on a purchase price. Officials said that the main pump, floating pump, and additional equipment (including lights, paint, etc.) would be supplied by the Elk Mills Poga Fire Dept at no additional charge. As of now, they have only raised $275 of the needed $25,000 but are hopeful that they will gain more donations with community involvement once those in our area are informed.